Eleven towns and cities have now put their names forward to become UK City of Culture in 2021. Perth, Paisley, Stoke-on-Trent, Sunderland, Coventry and Hereford had already put themselves up for the accolade when they declared their interest last year. Five more are now added: Warrington, Portsmouth, Wells, Swansea and the smallest city in Britain, St Davids. The chosen place will succeed Hull, which is the City of Culture for 2017. The Heritage Lottery Fund has pledged to give £3m to the winning city. To be successful, the 2021 winner will have to prove its bid is centred around heritage, and that it will build on existing investment it gets from the lottery fund. All final bids must be submitted by the end of April with a shortlist announced in July and the winning city named in December. Minister for Digital and Culture, Matt Hancock, said the UK City of Culture competition was a "fantastic opportunity" to use culture "as a catalyst for economic growth". "I am delighted to see so many bids from across the country, showing how many areas recognise the important role culture can play in the development and regeneration of communities. "UK City of Culture helps boost tourism and raises the profile of arts and culture. "The exciting funding commitment from the Heritage Lottery Fund is yet another incentive for towns to secure this prestigious title." BBC correspondent Nick Higham said most of the towns and cities to put themselves forward have been badly hit by the decline of traditional industries and see the bid as a way to attract investment, stimulate development and make local people feel good about their city. Since winning the title in 2013, Hull has seen a £1bn investment and it is estimated that the city's economy will have a £60m boost this year. 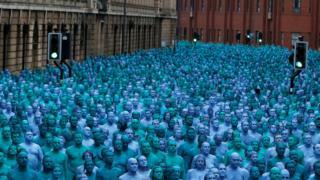 Last year, thousands came together to take part in Spencer Tunick's Sea of Hull project where they stripped naked and were painted blue. The resulting images are to be exhibited in the city later this year. Could Stoke be City of Culture?